BAK (Bcl-2 homologous antagonist/killer) is a novel pro-apoptotic gene of the Bcl-2 family. It has been reported that gastric tumors have reduced BAK levels when compared with the normal mucosa. Moreover, mutations of the BAK gene have been identified in human gastrointestinal cancers, suggesting that a perturbation of BAK-mediated apoptosis may contribute to the pathogenesis of gastric cancer. In this study, we explored the therapeutic effects of gene transfer mediated elevations in BAK expression on human gastric cancer cells in vitro. Eukaryotic expression vector for the BAK gene was constructed and transferred into gastric cancer cell lines, MKN-45 (wild-type p53) and MKN-28 (mutant-type p53). RT-PCR and Western Blotting detected cellular BAK gene expression. Cell growth activities were detected by MTT colorimetry and flow cytometry, while apoptosis was assayed by electronic microscopy and TUNEL. Western Blotting and colorimetry investigated cellular caspase-3 activities. BAK gene transfer could result in significant BAK overexpression, decreased in vitro growth, cell cycle G0/G1 arrest, and induced apoptosis in gastric cancer cells. In transferred cells, inactive caspase-3 precursor was cleaved into the active subunits p20 and p17, during BAK overexpression-induced apoptosis. In addition, this process occurred equally well in p53 wild-type (MKN-45), or in p53 mutant-type (MKN-28) gastric cancer cells. The data presented suggests that overexpression of the BAK gene can lead to apoptosis of gastric cancer cells in vitro, which does not appear to be dependent on p53 status. The action mechanism of BAK mediated apoptosis correlates with activation of caspase-3. This could be served as a potential strategy for further development of gastric cancer therapies. Apoptosis is critical, not only for tissue homeostasis, but also in the pathogenesis of a variety of diseases, including cancer. The transformation of gastrointestinal epithelial tissue to carcinomas has been shown to be associated with the progressive inhibition of apoptosis [1, 2]. The Bcl-2 family of genes appears to be important in the regulation of apoptosis. Members of this family are cellular homologues that are either pro-apoptotic (Bax, Bik and Bid) or anti-apoptotic (Bcl-2 and Bcl-XL) [3, 4]. Recently, BAK (a Bcl-2 homologous antagonist/killer) has been cloned as a Bcl-2-related gene [5, 6]. The BAK gene encodes a 211-amino acid protein with a relative molecular weight (Mr) of 23,400. Gene transfer mediated elevations in BAK protein levels accelerate apoptosis induced by growth factor deprivation in murine lymphoid, lung cancer and breast cancer cells , suggesting that BAK functions primarily as a promoter of apoptosis. BAK expression has been reported in normal gastrointestinal epithelium . Strong BAK immunoreactivity has been shown to be present in the gastric epithelial cells lining the gastric pits and parietal cells, whereas the self-renewing mucous cells located below the gastric pits in the gastric neck region are immunonegative . In gastrointestinal epithelial tissues, the up-regulation of BAK expression during differentiation may help to ensure that cell turnover occurs in a normal fashion. However, it has been reported that gastric tumors have reduced BAK levels when compared with the normal mucosa . Moreover, mutations of the BAK gene have been identified in human gastrointestinal cancers, suggesting that a perturbation of BAK-mediated apoptosis may contribute to the pathogenesis of gastric cancer [11, 12]. Several recent reports have demonstrated the feasibility of using gene transfers to treat gastric cancers [13, 14]. In the current study, utilizing BAK gene transfer via plasmid vector, we investigated the apoptosis inducing effects of BAK overexpression on human gastric cancer cells in vitro, in order to explore a novel strategy for gene therapy of gastric cancer. The human gastric cancer cell lines, MKN-45 (wild-type p53) and MKN-28 (mutant type p53), were obtained from the Typical Culture Center of Wuhan University (China). Cells were maintained at 37°C in a humidified atmosphere of 5% CO2 in RPMI 1640 (Gibco PRL) supplemented with penicillin/streptomycin (100 units/ml and 100 μg/ml, respectively) and 10% fetal calf serum (FCS). Restriction enzymes and DNA recovery kits were purchased from Promega Company. T4 DNA Ligase was purchased from the TaKaRa company. Propidium iodide was purchased from the Sigma company. TUNEL and caspase-3 activity detection kits were purchased from the Boster and Clontech companies respectively. Plasmid pET-BAK was kindly provided by Dr. Patty Wendel (Cold Spring Harbour, USA), which contained the BAK cDNA (633 bp) between the restriction sites for XhoI and HindIII. Prof. Shen Qu (Department of Biochemistry, Tongji Medical College, China) provided the eukaryotic vector pcDNA3. XhoI and Hind III digested the plasmids, pET-BAK and pcDNA3, to recover the BAK gene (633 bp) and linear vector fragments (5.4 Kb) respectively. The ligation reaction was conducted with T4 Ligase. According to the physical maps of both the BAK gene and vector, XhoI, HindIII, XhoI and HindIII digested the recombinant respectively, for restrictive enzyme reaction assay. For both MKN-45 and MKN-28 cell lines, untransfer control, pcDNA3 and pcDNA-BAK transfer groups were designed. Gene transfer was conducted with Lipofectamine 2000 (Gibco company, USA), according to the suggestion of the manufacturer. 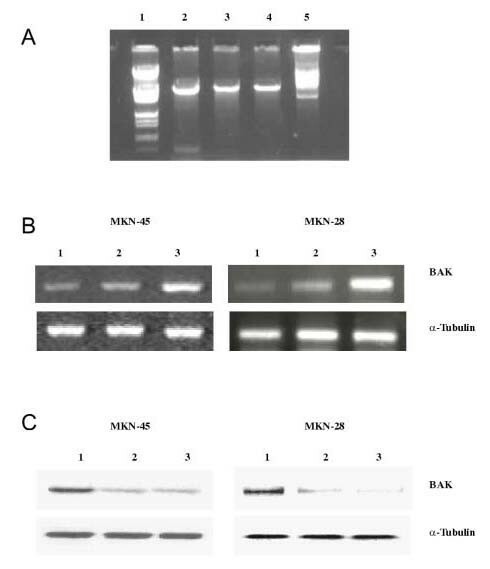 Cellular BAK mRNA expression levels were assayed by reverse transcription polymerase chain reaction (RT-PCR). Cellular total RNA extraction was conducted with TRIzol (Life Technologies company). After the reverse transcription reaction, PCR amplification reaction was conducted with the following primers: BAK (502 bp) upstream 5'-CTGCCCT CTGCTTCTGA-3', downstream 5'-CGTT CAGGATGGGACCA-3'. α-Tubulin (295 bp) upstream 5'-CCCGTCTTCAGGGTCTCTTG-3', downstream 5'-TTAAGGTAAGTGTAGGTTGGG-3'. α-Tubulin served as an internal control for PCR. Amplification products were separated with 1% agarose electrophoresis and observed under ultraviolet light. The brightness ratios between BAK and α-Tubulin were evaluated with gel computer image system (Gel Doc 1000, Bio-Rad company). Cellular BAK protein expression levels were assayed via Western Blotting. The extraction, quantification and separation of proteins were conducted according to Molecular Cloning. Blots were incubated sequentially with 1% nonfat dry milk, mouse monoclonal anti-BAK antibody (Boster Company) and goat radish peroxidase-conjugated antimouse immunoglobulin G, and evaluated using an ECL Western blotting kit. α-Tubulin served as an internal control for the immunoblot. Protein band intensities were determined densitometrically using the Computer Imaging System. The MKN-45 and MKN-28 cells were seeded at 3 × 104/ml density in 96-well chamber slides (each group had five wells). After transferring for 1d, 3d and 5d, cellular growth was detected by 3-(4,5-dimethylthiazol-2-yl)-2,5-dimethyltetrazolium bromide (MTT, Clontech) colorimetric method. Each well was given 20 μl of 0.5% MTT and cultured for another 4 h. The supernatant was discarded, then the pellet was given 100 μl of dimethyl sulfoxide. When the crystal dissolved, the optical density A values of the slides were read on an enzyme-labeled Minireader II at 570 nm. Cellular proliferation inhibition rates are calculated as (%) = (1-average A 570nm value of experimental group/average A 570nm value of untransfer control group) × 100%. After transferring for 3d, 2 × 106 cells from the above groups were collected. Cells were washed twice with 0.01 mol/L phosphate-buffer saline (PBS) and fixed in 70% ethanol overnight at 4°C. Then the cells were washed once with PBS, digested by 200 μl RNase (1 mg/ml) at 37°C for 30 minutes, and stained with 800 μl propidium iodide (50 μg/ml) at room temperature for 30 minutes. The DNA histograms were assayed by flow cytometry (Becton Dickson company) and analyzed with CELLQEST software. Cancer cells from the groups above were collected, rinsed by PBS, fixed using 2.5% glutaraldehyde for 30 minutes, and then washed with PBS. After routine embedment and slicing, cellular ultrastructure was observed under an electronic microscope. The TdT-mediated dUTP-biotin nick end labeling (TUNEL) method detected the apoptotic rates. After blocking with 0.3% H2O2 for 30 min, slices were digested by Proteinase K (20 mg/L) for 20 min, then incubated with the TUNEL reaction solution at 37°C for 60 min. Then, the slices were incubated with peroxidase-conjugated antibody at 37°C for 30 min, stained with diaminobenzidine (DAB) and counterstained using haematoxylin. Instead of the TUNEL reaction solution, PBS was used as a negative control. Under a light microscope, the volume of the apoptotic cells became smaller, with shrinking nuclei and a specific palm-yellow color in the chromosome. Cellular caspase-3 protein expression determinations came from Western Blotting (as the same method above). 2 × 105 cells from above groups were collected, 50 μl of cellular lysis buffer was added, and then they were incubated on ice for 10 min. After centrifugation (12000 rpm) at 4°C for 3 min, the supernatant was collected and added sequentially with 50 μl 2 × Reaction Buffer, 5 μl 1.0 mmol/L caspase-3 substrate DEVD-pNA, and incubated at 37°C for 1 h. After being transferred into 96 wells, the optical density A values of the slides were read on enzyme-labeled Minireader II at the wave length of 405 nm (A405 nm), which is the relative activities of caspase-3. Data analysis was performed using SPSS 10.0 statistical software. The eukaryotic expression vector, pcDNA-BAK (6.0 Kb), was constructed. Electrophoresis, on a 1% agarose gel, showed the BAK cDNA insertion reactions into the recombinant were successful (Fig. 1A). After electrophoresis of RT-PCR products, BAK amplification bands could be observed in both untransfer and pcDNA3 transfer groups. The difference between them is not significant (P>0.05). After transferring with pcDNA-BAK for 3d, BAK mRNA levels in MKN-45 and MKN-28 cells were significantly increased (P<0.01) (Fig. 1B). 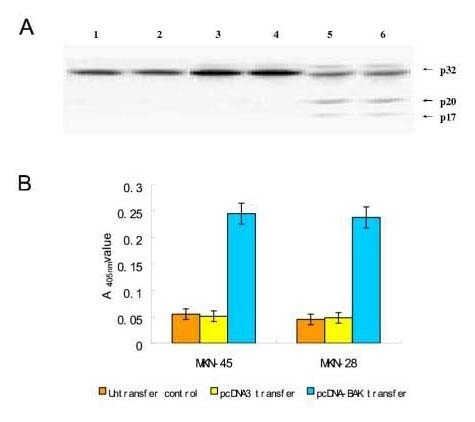 Western Blotting and densitometric analysis indicated BAK protein bands brightness of pcDNA-BAK transferred MKN-45 and MKN-28 cells were significantly higher than those of untransferred and pcDNA3 transferred cells respectively (P<0.01) (Fig. 1C). BAK gene overexpression mediated by gene transfer. A, Restrictive enzyme reaction assay after recombinant pcDNA-BAK digested with Xho I+Hind III (Lane 2); Hind III (Lane 3); Xho I (Lane 4); The blank pcDNA-BAK (Lane 5) and DNA marker λ DNA/Hind III + EcoR I (Lane 1) were used as controls. B, Reverse transcription polymerase chain reaction assay of BAK mRNA levels in untransferred (Lane 1), pcDNA3 transferred (Lane 2) and pcDNA-BAK transferred (Lane 3) gastric cancer cells. The expression level of α-Tubulin was used as a control. 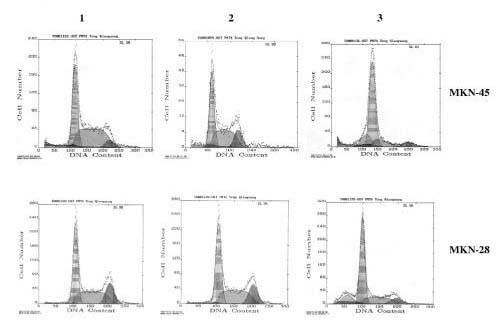 C, Western Blotting analysis of BAK protein levels in untransferred (Lane 3), pcDNA3 transferred (Lane 2) and pcDNA-BAK transferred (Lane 1) gastric cancer cells. The expression level of α-Tubulin was used as a control. In untransfer control group, the A570nm values were increased with the incubation time, indicating the active in vitro growth of MKN-45 and MKN-28 cells. After transferring with pcDNA-BAK for 1d~5d, the growth activities of MKN-45 and MKN-28 cells were both reduced to variable extents, with their inhibitory rates being 10.25%~32.41% (P<0.01), 11.54%~33.45% (P<0.01), respectively (Fig. 2). Growth inhibition effects of BAK overexpression on gastric cancer cells. MTT assay after MKN-45 and MKN-28 cells were transferred with blank pcDNA3 and pcDNA-BAK vectors for 1d, 3d and 5d. On histograms of flow cytometry (Fig. 3), the S phase ratio in pcDNA-BAK transferred cancer cells was significantly lower than that of untransferred control, while cell cycles were arrested at the G0/G1 phase. In both pcDNA-BAK transferred MKN-45 and MKN-28 cells, sub-diploid DNA peak, corresponding to the apoptotic cell fraction, could be detected. Cell cycle arrest effects of BAK overexpression on gastric cancer cells. Cell cycle analysis after MKN-45 and MKN-28 cells were transferred with blank pcDNA3 (Lane 2) and pcDNA-BAK (Lane 3) vectors for 3d, with untransferred cancer cells as controls (Lane 1). Sub-diploid peaks could be detected in both pcDNA-BAK transferred MKN-45 and MKN-28 cells. After transferring with pcDNA-BAK, parietal MKN-45 and MKN-28 presented characteristic morphological changes of apoptosis, such as nuclear shrinking, chromatin congregating around the nuclear membrane, reduction of cell volume and integrity of nuclear membrane, which could be viewed under an electronic microscope (Fig. 4A). The TUNEL assay indicated that the apoptosis rates of untransferred MKN-45 and MKN-28 cells were 4.7%, 4.2% respectively after being cultured for 3d. After pcDNA-BAK transfer for 3d, the apoptosis rates of MKN-45 and MKN-28 cells were 21.4%, 20.1% respectively (P<0.01). (Fig. 4B). Apoptosis inducing effects of BAK overexpression on gastric cancer cells. A, Morphological observation of gastric cancer cells under electronic microscope: Normal cells in untransferred group; Chromatin congregating around nuclear membrane in pcDNA-BAK transferred cancer cells; Nucleus shrinking in pcDNA-BAK transferred cancer cells. 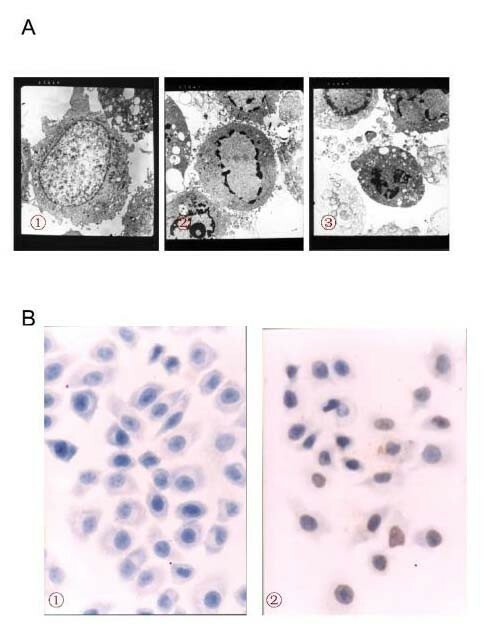 B, Apoptosis detection by TUNEL: There were no obvious apoptotic cells in the untransferred group; The pcDNA-BAK transferred cells reduced in size with obvious nuclear staining. After pcDNA-BAK transfer, the 20 k Da (p20) and 17 k Da (p17) protein bands, subunits of caspase-3, could be detected in MKN-45 and MKN-28 cells (Fig. 5A). The A405 nm values in untransferred MKN-45 and MKN-28 cells were 0.055 ± 0.008, 0.045 ± 0.010 respectively. After transferring with pcDNA-BAK for 3d, their cellular A405 nm value were increased to 0.245 ± 0.012 (P<0.01), 0.238 ± 0.011 (P<0.01) (Fig. 5B). Effects of BAK overexpression on activities and levels of caspase-3 in gastric cancer cells. A Western Blotting assay of caspase-3 expression in untransferred MKN-45 cells (Lane 1), pcDNA3 transferred MKN-45 cells (Lane 2), pcDNA-BAK transferred MKN-45 cells (Lane 5), untransferred MKN-28 cells (Lane 3), pcDNA3 transferred MKN-28 cells (Lane 4) and pcDNA-BAK transferred MKN-28 cells (Lane 6). The inactive caspase-3 precursor (p32) was cleaved into its active subunits, 20 k Da (p20) and 17 k Da (p17).B, Caspase-3 activities assay for MKN-45 and MKN-28 cells transferred with pcDNA3 or pcDNA-BAK for 3d. Gastric cancer is the most common malignant tumor of the gastrointestinal tract in the world. There has been a clinical need to identify ideal candidate genes for use in treating gastric cancer patients with gene transfer strategies . One promising group is the pro-apoptotic members of the Bcl-2 family (Bax and BAK), which have been shown to induce apoptosis after gene transfer via plasmid vectors in vivo [16, 17]. The pro-apoptotic BAK gene is located on chromosome 6 and shares homology with the entire Bcl-2 family, including the anti-apoptotic and pro-apoptotic members . In fact, the family members interact through highly conserved areas of Bcl-2 homology (BH1, BH2, and BH3) that allow hetero- and homodimerization and the consequent close regulation of apoptosis . In the case of Bax, this scheme has been well worked out in a rheostat model in which excess pro-apoptotic Bax suppresses Bcl-2 and induces apoptosis via cytochrome c . Less is known about BAK, but there is evidence that BAK can form heterogenous dimers with Bcl-2 or Bcl-xL to inhibit their anti-apoptotic functions . The deficiency in BAK was directly responsible for the arrest in cytochrome c release. This capability was restored to the BAK-deficient cells by the insertion of recombinant BAK into purified mitochondria from these cells . Furthermore, synergistic activity was detected in the presence of combinations of suboptimal doses of recombinant BAK and Bax, suggesting, that in the presence of a low dose of recombinant BAK, the resistance of these mitochondria to Bax-mediated cytochrome c release was reversed . As recently reported for hepatocytes from BAK-/- mice , BAK-deficient Jurkat cells were also resistant to tBid induction of cytochrome c release, suggesting that in these leukemic cells, BAK is involved in mitochondrial cytochrome c release induced by either tBid or Bax. Current evidence indicated that deficiency of BAK expression is closely correlated with occurrence and development of tumors . Tomkova et al investigated the BAK expression in twenty cases of neoplastic skin diseases. They found seventeen were negative for immunostaining, and the other three cases showed only weak immunostaining in the regions of tumor formation . Kondo et al found that positive ratios of BAK expression were negatively correlated with the pathological stages and clinical phases of gastric cancer . Many kinds of tumor therapeutic drugs, such as perillyl alcohol and γ-interferon, function through up-regulating BAK expression . Recently, Pataer et al reported that adenoviral-mediated overexpression of BAK could induce obvious apoptosis in lung and breast cancer cells, which provided a novel therapeutic strategy for cancer therapy . In the present study, high levels of BAK protein were induced in gastric cancer cell line MKN-45 and MKN-28 (Fig. 1B,1C). It was also indicated that BAK overexpression could arrest the cell cycle (Fig. 2B) and induce apoptosis in cancer cells (Fig. 3A,3B). Current evidence indicated that the caspases, which are cysteine proteases of the ICE/CED-3 family, are the central components of the cell death machinery in various forms of apoptosis. Of course, caspase-3 is the most likely candidate for a mammalian cell death regulator by cleaving vital cellular proteins . In this study, we found that the inactive caspase-3 precursor was cleaved into the 20 kDa and 17 kDa subunits, forming the active protease during BAK overexpression-induced apoptosis (Fig. 4A,4B). In addition, our studies suggest that this process is p53 independent because BAK-induced apoptosis occurred equally well in p53 wild-type (MKN-45) or p53 mutant-type (MKN-28) cells. This observation may be explained by the fact that the Bcl-2 family members function downstream from p53 in the apoptotic cascade. Then the clinical use of the BAK vector may be independent of p53. If so, then the treatment of p53 mutant or resistant cancer cells with BAK gene transfer might be possible. The data presented in this paper show for the first time that overexpression of BAK, mediated by plasmid vectors, leads to apoptosis of gastric cancer cells in vitro. This anticancer strategy does not appear to be dependent on p53 status. The action mechanism of BAK mediated apoptosis, however, correlates with activation of caspase-3. Consistent with other finding in BAK genes, we believe BAK plays a pivotal role in the process of apoptosis. This serves as a potential target for further therapeutic development of gastric cancer. We thank Dr. Patty Wendel (Cold Spring Harbour Laboratory) for her kind gift of the BAK gene. We also appreciate Prof. Dechun Li (Johns Hopkins University School of Medicine) for his great help in the preparation of this manuscript. QST conceived of the project, directed the experiments, analyzed the data and prepared the manuscript. LDZ participated in vector construction, gene transfection and RT-PCR. LW carried out the Western Blotting. JL participated in flow cytometry assay. WQ carried out TUNEL assay. All authors read and approved the final manuscript.